a 20% discount on the price of the game! When you pre-order, the game will cost $19.95 (versus $24.95, the price tag it will carry upon full release). This entry was posted on Tuesday, December 14th, 2010 at 9:51 PM and is filed under Game Updates. 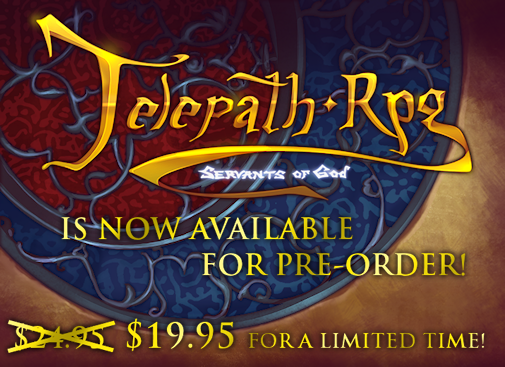 This post is tagged pre-ordering, Telepath RPG: Servants of God. You can follow any responses to this entry through the RSS 2.0 feed. leave a response or trackback from your own site.